Plot: The setting is after World War 2. Place Tokyo. Eddie Kenner is on a U.S. Army Special assignment where he is to investigate and figure out a group of murderers who happens to be led by an Ex-serviceman Sandy Dawson. Eddie must mingle with the group to learn the truth and stop them before there next crime. Here is a nice old-school Crime Drama. This Film-Noir is always a treat to return to. Now it’s fashioned on a wonderful, top quality Blu-ray. This is another excellent product by Twilight Time. Another example of how to treat cinema. Twilight Time never fails in creating wonderful transfers and sound excellence for important pieces of old-school cinema. House of Bamboo is no different. A wonderful cast of actors and actresses grace this film, with their mastery in performing. The wonderful Robert Ryan, the beautiful Shirley Yamaguchi and the powerful, brilliant and amazing Robert Stack. Also adding to the mix of the film is an array of extraordinary performers of Hollywood. The equally amazing Cameron Mitchell, Brad Dexter, Sessue Hayakawa, and Biff Elliot. I think the hardest reality I have with watching older movies is, I get a little teary eyed in realizing that every one of those performers I mentioned are all long died. It’s amazing when you watch a brilliant film, see the brilliant performances, and then think to yourself, their all gone. They don’t make actors, and actresses like they used to. Combining all them together, in a group setting they have acted in well over 700 performances. I also think on an interesting note in House of Bamboo, there are some key uncredited roles. The wonderful, “Dammit Jim, I’m a Doctor,” Star Trek’s Deforest Kelley, has an uncredited role playing the character Charlie. Also the wonderful Harry Carey Jr. has an uncredited part, playing the character John. I love to watch old films, and see the vast array of film performing excellence. 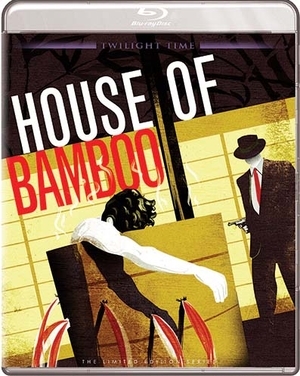 House of Bamboo was directed by one of my favorite directors of all time, Samuel Fuller. A master talent in creating films that not only linger with you, but give you an experience in saying, WOW. His films are some of the greatest films ever created in cinema history. Many of his films are showcased as important pieces of film. He not only was a director, he was an actor, and writer of many of his films, or at least co-writer of films that he created. All one has to do is look at his notches on his movie making belt, and realize that this man was a directing genius. 1963’s Shock Corridor, 1964’s The Naked Kiss, 1980’s The Big Red One, 1982’s White Dog. He was truly a gift of film making that left a movie loving world better because of his visionary expertise. Twilight Time has also released one of his masterpiece films 1957’s The Wayward Bus on one of their special edition blu-rays which is still available. I have always thought that House of Bamboo was a much underrated film. I think it has a classic crime setting that only old-school Hollywood understood. This was written by another powerful man in Hollywood, or at least left a lasting mark on the world of cinema. Harry Kleiner wrought a wonderful collection of films. From 1954’s Carmen Jones, to the one he is probably best known for, the screenplay for the film adaption of Steve M McQueen’s Bullitt (1968). He also wrote the screenplay for the film adaption of one of my favorite childhood films, 1966’s Fantastic Voyage. His last movie he wrote the screenplay for was the action comedy Red Heat (1988), just showing you his multi-talented ways of writing just about anything. Now something I have not mentioned yet that makes this movie all the more amazing is the cinematography by Joseph MacDonald. MacDonald captured a wonderment of film. He had such a talent in expressing a film, and House of Bamboo shows that reality. That’s is something about House of Bamboo, is the technical side, or the behind the camera reality creates a wonderment in itself. The costumes, sets and makeup all come off as brilliant in creating a solid film. As always Twilight Time has done another fantastic job in the department of the audio and the video. The transfer is beautiful, vibrant and crisp in image. The audio is smooth. Isolated music Track. Here again is another wonderful example of Twilight Time Blu-ray’s excellence. They craft this wonderful special feature often on their products. This time it’s another amazing accomplishment. The man behind the music is Leigh Harline. This Academy Award Master created much music for a vast array of cinema. From composer, music department, to soundtracks he graced it all. Masterpiece scores like Disney’s 1937 masterpiece Snow White and the Seven Dwarfs, 1940’s masterpiece Pinocchio, 1942’s Pride of the Yankees, and many others both small and large outlets, from TV to film. His music has been used on many soundtracks even up to most recently in 2015’s Avengers: Age of Ultron. He was a master. Twilight Time honored this master and gave him an excellent product and special feature to be listened to over and over again. You get the audio commentary by film historians Julie Kirgo, Nick Redman which is as I have stated many times before, worth the purchase just to listen to these film guru’s talk about film. Both are knowledgeable and equally important to these special editions. You also get Audio Commentary with Film Historians Alain Silver and James Ursini. Two times the excellence. Brilliant always to hear film lovers and historians speak about, what else, film. Insert Booklet written by Film Historian Julie Kirgo. Aces it as always. Another must own, must see Special Edition Blu-ray. The film has never looked any better. Twilight Time has aced it yet again with their important understanding of film.